Let the Sunset fantasy begin. We’re past Memorial Day, so you can all bust out the linen togs and start working on your guacamole recipes. You know how it rolls from here on out: Casual parties start to happen. You want to bring something that you know will be appreciated and eaten, that is homemade but not terribly taxing and that can probably be pulled off without a recipe. 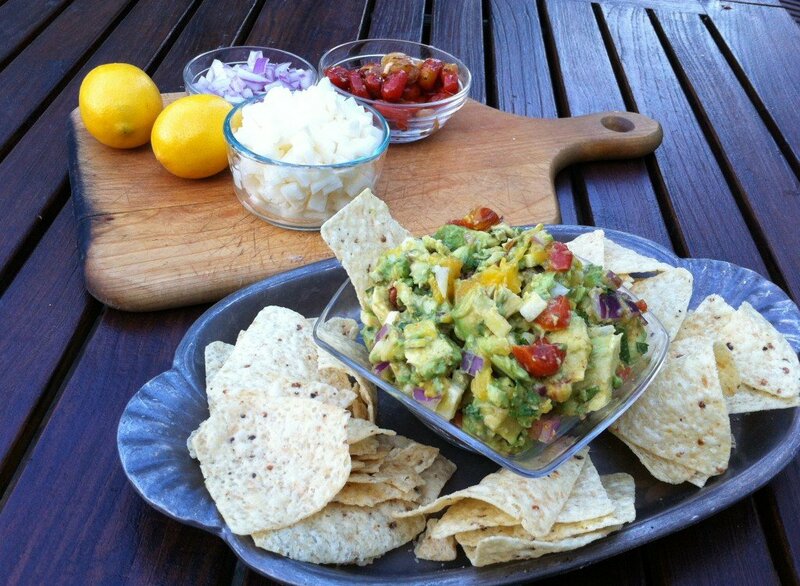 As long as you can lay your hands on ripe avocados you simply can’t go wrong with a good guacamole. And you can go really right with this guacamole, because it has jicama AND mangoes, both of which (along with avocados) make me fantasize that I am actually in a Sunset magazine photo shoot. You’ve got crisp, sweet and creamy mixed in with spicy, tangy and juicy. And then you add cilantro, which makes everyone but my sister happy. And since it’s almost her birthday we can all just go ahead and substitute fresh mint for the cilantro if we want. Because it’s guacamole…and the first rule of guacamole is to improvise at will! No adobo? No problemo! Just sprinkle in some chile powder. It’ll all work out, even without a drop of tequila. To show bicoastal reverence of a good guacamole, this recipe comes from Meracadito Cantina in Manhattan via Food and Wine, and with many thanks to our friendly local Hannaford’s where jicama is a totally reasonable $1.99/lb and where they double your refund if it turns out to be no bueno (see note below). In a large bowl, gently stir the avocados with the tomato, onion, mango, jicama, cilantro, chipotle, jalapeño and lemon juice until well mixed but still slightly chunky. Season with salt and serve with tortilla chips. Olé! Note: Whereas in California the jicama roots make a quick jaunt from Mexico, they travel much further to get to our stores in New England. You most often find them heavily waxed…Brazilian super model before the SI swimsuit shoot waxed. We’re talking a thick coat that can prevent you from seeing the jicama’s true self. Look for jicama with no soft spots and no oozing juices (never an excellent sign of health on anything). It should be firm, crisp and mild tasting when peeled. You won’t need it all for this recipe so slice up the rest, add some lime juice and store it in the fridge for snacks… or the next party. This entry was posted in Appetizers, Apres Anything, Start it up, Uncategorized on May 30, 2014 by Edie Morgan. Pingback: January - Bring It!